Awesome Possum Pie at Front Porch Diner in Springdale. 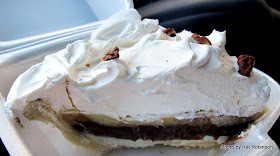 I have been on a quest over this past year -- to discover the best pie in the state of Arkansas. Turns out, there’s no really good way to determine this. Our pies are as varied and unusual as our crops. You can’t compare a grain of rice to a watermelon, and you can’t really compare a fried pie to a meringue pie. But you can bring together a list of pies that contain all those tasty items, as I have done for the Arkansas Times. The list contains five fried pies, over a dozen meringue pies and seven of the best possum pies I’ve found anywhere. 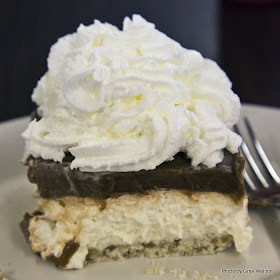 Sweet Treats in Lamar adds a vanilla pudding layer on top. And it’s about this possum pie I want to speak. See, it’s everywhere… and how we do it here in Arkansas is different from how it’s done elsewhere. Elsewhere it can be any sort of white topping that obscures a layer of, well, anything -- peaches, pecans, apples, you name it. In Arkansas, the Possum Pie consists of three layers -- a cream cheese layer (sometimes substituted with a sour cream or vanilla pudding instead), a chocolate custard layer and a whipped topping layer. Most places serve theirs up on a pecan sandy crust -- ie, an unsweetened flour crust dotted with pecans. 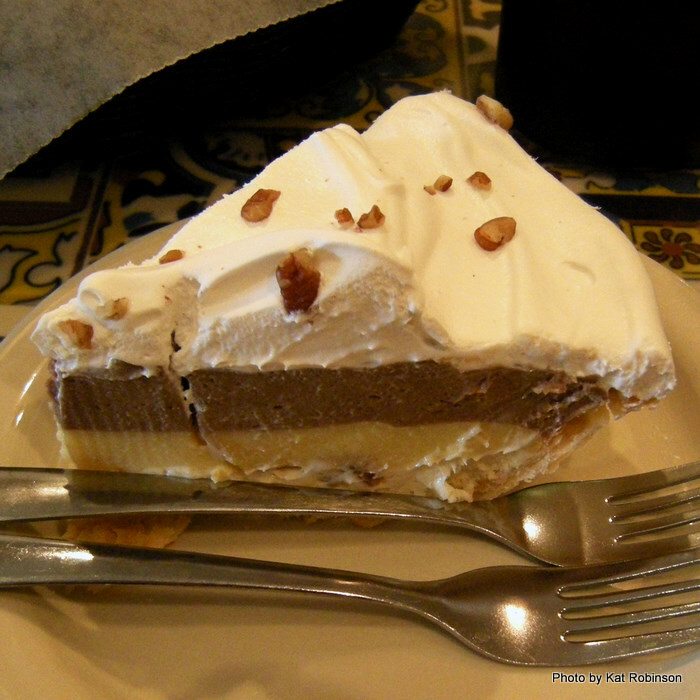 Many scatter pecans over the top of their pies. It’s served up in so many restaurants but is more prevalent in said restaurants in western Arkansas. For those who are interested in making their own, here’s an easy recipe for two pies. Yes, you’ll want two. 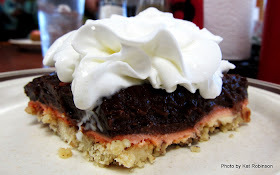 Barr's Junction's Chocolate Torte contains the same ingredients. The pies can be frozen, though I recommend if you do so freeze them before you put on the Cool Whip and dot it on later. Just looks better. One more thing. There is a case that can be made for the Possum Pie to become the state pie of Arkansas. We have a state dirt, a state grape wine, a state bird, a state slogan -- why not create the Possum Pie as our state pie? Comments welcome. I think we should absolutely make Possum Pie the State Pie. Where do I sign? I'm actually making possum pie today! :D It's fun to see how many different kinds there are. Thanks for having a recipe like this up on your blog!